Beretta 70 "New Puma" in .32 ACP caliber "New Puma" was the trading name in America for the Model 70 selfloading compact pistol series; those pistols were offered in .7'65mm-Browning (a.k.a. 32-ACP) and in .22-Lr, and in a wide array of barrel lenghts and sights options. 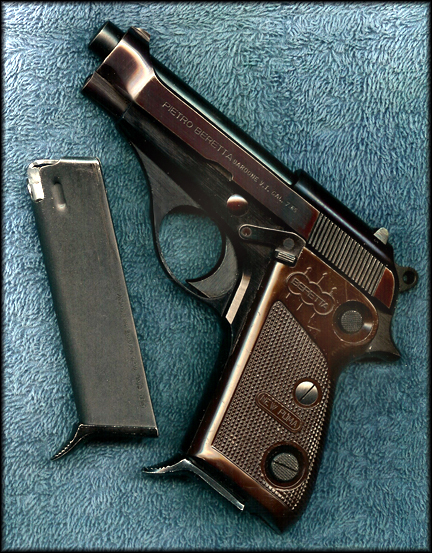 There was also a .380-ACP (9mm-Kurtz) version, named the Beretta "70S". Follow the link below to find out a complete translation in English of the BERETTA "Model 70" series brochure of the time. The production of the Beretta 70 pistols series started at the beginning of the 1960s (probably 1962), to equip with .32-ACP pistols the Italian Police forces (bot the "civilian" National Police and the "Carabinieri", which are Military Police like the French "Gendarmerie"), which at the time were still using the .32-ACP as standard ammunition (the 9mm-Luger being reserved to Highway Patrol and special units until the mid'1970s), and which at the time were already feeling long in the tooth the Beretta M-32 pistols of WW-2 heritage; at a certain point, the Italian Police forces partially switched from .32 to .380 and adopted a number of Beretta 70S and "Cheetah" series pistols, but by the beginning of the 1980s the M-92 series was placed as standard service sidearm. The production of the Beretta "Model 70" series ended somewhere around the late 1970s; I am not sure about the year, what I know is that by the 1979 the machineries to build the "Model 70" and the "Model 951" Beretta pistols were sold to Iraq, which by the time was a friendly country, and that manufactured them as the "Tariq" pistols; some years before, machineries to build the "Model 951" pistols had also been sold to Egypt.